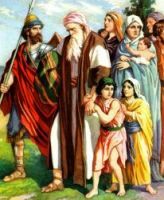 Daniel of the Bible is considered the fourth of the "greater prophets." Nothing is known of his parentage or family. He appears, however, to have been of royal or noble descent, and to have possessed considerable personal endowments. 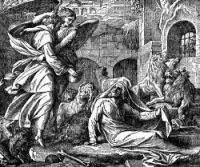 He was taken to Babylon in the "third year of Jehoiakim" (B.C. 604), and trained for the king's service, along with three other boys. He was divinely supported in his resolve to abstain from eating "the king's meat" for free of defilement. 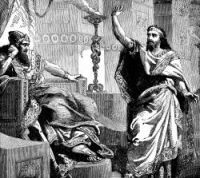 At the close of his three years of schooling, Daniel had an opportunity of exercising his peculiar gift of interpreting dreams, on the occasion of Nebuchadnezzar's decree against the Magi. 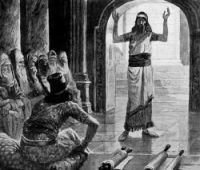 Impressed and pleased with Daniel's ability to interpret King Nebuchadnezzar's dream when none of the various wise men could, Daniel was made "ruler of the whole province of Babylon." On this page are several pictures of Daniel in the Bible taken from my collection of old religious books. You're welcomed to use these Daniel Bible illustrations in your art projects. 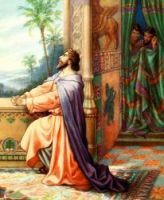 Click on the Daniel Bible drawings below to see more details about saving a free image or about purchasing the images of Daniel from the Bible at a higher resolution.